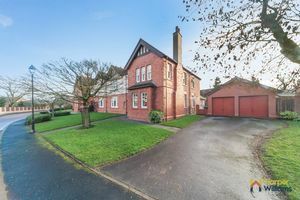 We are thrilled to offer for sale ''Maple Lodge'', which is a picturesque and imposing large semi-detached family home, situated on arguably Culcheth's most sought-after estate. Stonyhurst is a unique and period late Victorian award-winning 'refurbishment' development, which was cleverly designed and converted by Redrow, located off the ever-prestigious Twiss Green Lane. Only once in a blue moon do these striking properties come to the market, so trying to get your hands on one can be like waiting for 'gold dust'! This is no exception, given it is the first time the property will change hands from new almost 25 years ago! This fabulous family home offers substantial living accommodation throughout, including a grand hall, two receptions room, a separate study and has been cleverly extended by the current owners to create an impressive 'hub of the home' open plan family kitchen and living area, which makes the perfect addition to this already breathtaking family residence. First impressions count! From the moment you walk up to brick-built entrance porch with an original feature archway, you will be eager to see what the rest of this spectacular property has in store. An internal viewing will reveal a magnificent entrance hall, formal lounge with feature sash style windows, second reception room with double patio doors opening onto the rear garden, cloaks cupboard, WC and 'Wow Factor' open plan kitchen and family room with a separate study room off to the ground floor. 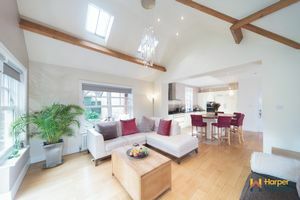 To the first floor, there is a dreamy landing, a master bedroom with an ensuite shower room, three further double bedrooms, a luxurious bathroom and a separate utility room, which was formerly the ensuite to the second bedroom. Externally there are gardens laid to lawn, a large driveway providing ample off-road parking which in turn leads to the detached garage, and a generous garden to the rear which is fully enclosed and private not being overlooked and with the major advantage of being a sunny aspect - perfect for those summer days and evenings! Culcheth is a quaint family village renowned for its community spirit, excellent schooling options including the famous Twiss Green Primary school, village amenities, a selection of bars and restaurants, fantastic motorway links and the prestigious Leigh Golf Club which are all only a stone’s throw away. If you snooze, you may lose with this one, so registering your early interest is essential! 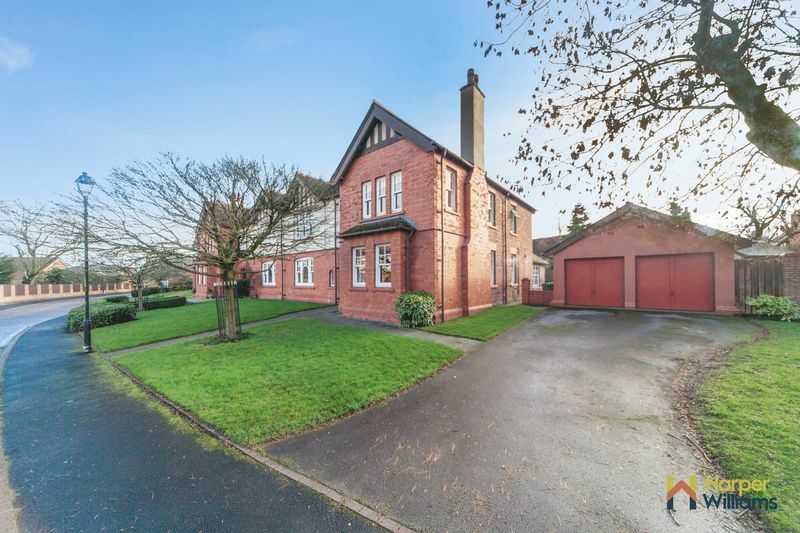 A stunning brick-built porch which oozes character including an original feature archway, stained glass windows, tiled flooring outside lighting and a solid entrance door. 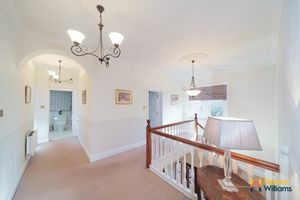 If a grand entrance hall is one of your main tick boxes, then this one certainly aims to please! 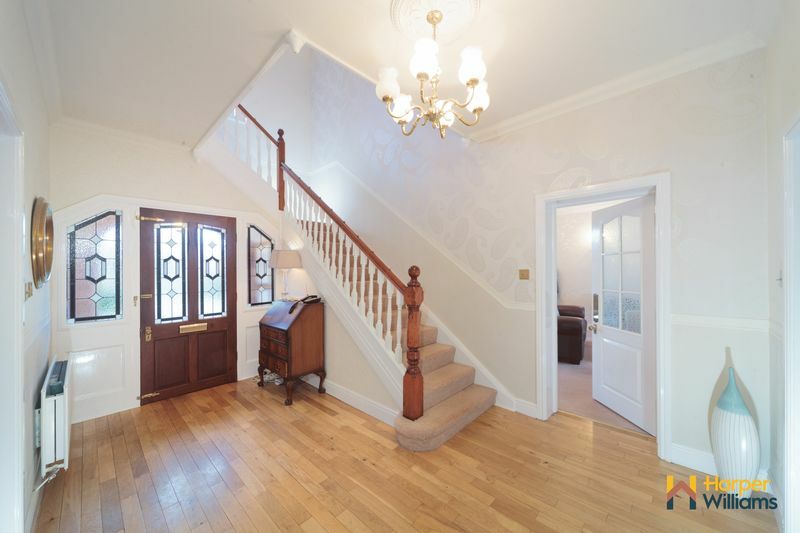 A welcoming hallway with feature high ceilings with ornate coving and decorative ceiling roses, a stunning staircase rising to the first floor, central heating radiator, oak flooring and ceiling points. Access to all first floor accommodation and archway into the open plan kitchen/ family room. 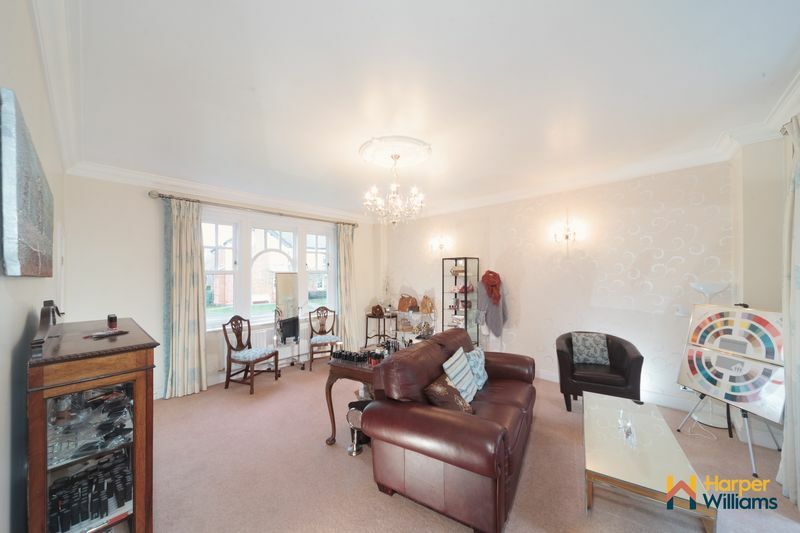 A generous formal lounge which is light and airy with dual aspect sash style windows to the front and side elevations making this a lovely reception room. 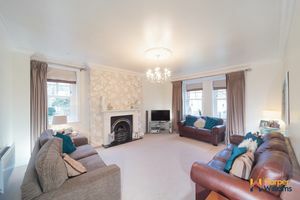 High ceiling with decorative coving and two ceiling light points inset with centre roses, warmed by two central heating radiators and focal point cast iron fireplace housing a gas fire with a backplate and granite hearth with an off white stone fire surround. TV point. Another spacious reception room which is multi-purpose and currently used as a home studio/ sitting room, again very light and airy with ample natural light from the large sash style window to the front and double patio doors to the rear which open onto the rear garden. Warmed by two central heating radiators, there are two feature wall lights, ornate coving ceiling with a centre rose and ceiling light point and a large understairs storage cupboard with a light. A walk-in cloaks cupboard with a light and oak flooring. Fitted with a low level WC, vanity wash hand basin, ceiling light point, oak flooring and a double glazed frosted window. 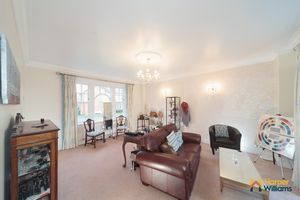 A fantastic 'hub of the home' for the ground floor living space. The kitchen area (14' 7" x 11' 7") boasts an extensive range of contemporary cream 'shaker' style wall and base units with dark granite worktops and a large centre island with a solid wooden worktop. 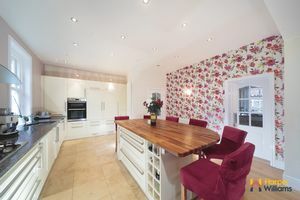 The kitchen comprises an array of integrated appliances including a dishwasher, fridge/freezer, 5-ring gas hob with a stainless steel extractor hood over, oven and grill, large larder cupboard, built-in wine rack and inset sink with a mixer tap and drainer. There is stone tiled flooring to the kitchen area and then oak flooring throughout continuing into the family room. 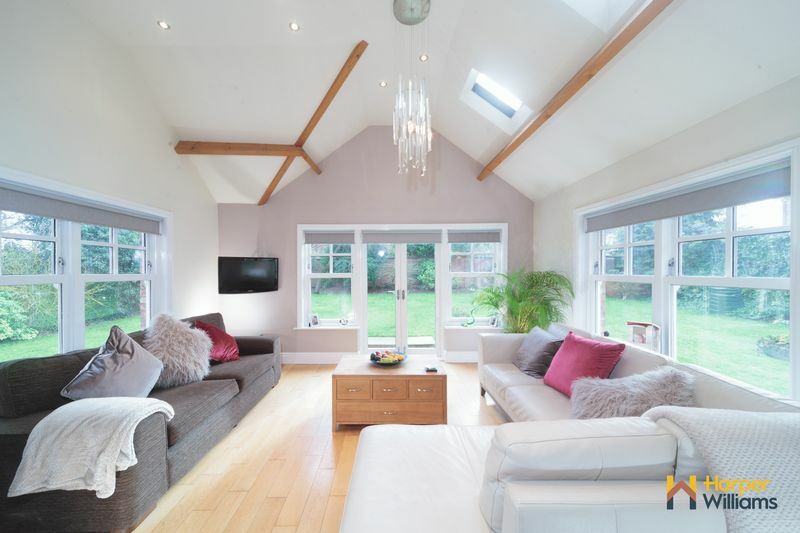 There is a large sash style window to the side aspect allowing plenty of natural light, contemporary style radiator, spotlights to the ceiling and opening into the family room. A beautiful addition to the kitchen with a feature vaulted ceiling with wooden beams and velux windows to one side and windows to all aspects including double patio doors opening onto the rear garden making this a lovely bright and airy room. Contemporary style central heating radiator, spotlights and oak flooring. 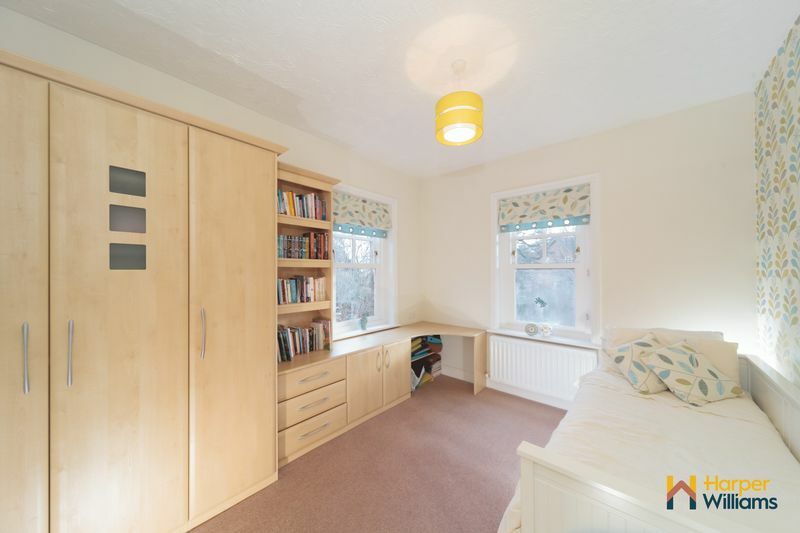 A perfect study room which is dual aspect with windows to the side and rear elevations, coved ceiling, ceiling light point, central heating radiator and oak flooring. Although currently used as a study, this room would also make a great utility space. Or both! 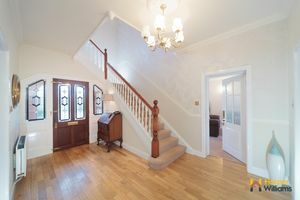 A dreamy landing with a large feature sash style window to the front aspect which makes a talking focal point, original wooden staircase, coved ceiling and two ceiling light points both with ornate centre roses, access to the loft area and a large built in airing cupboard which houses the hot water cylinder tank. 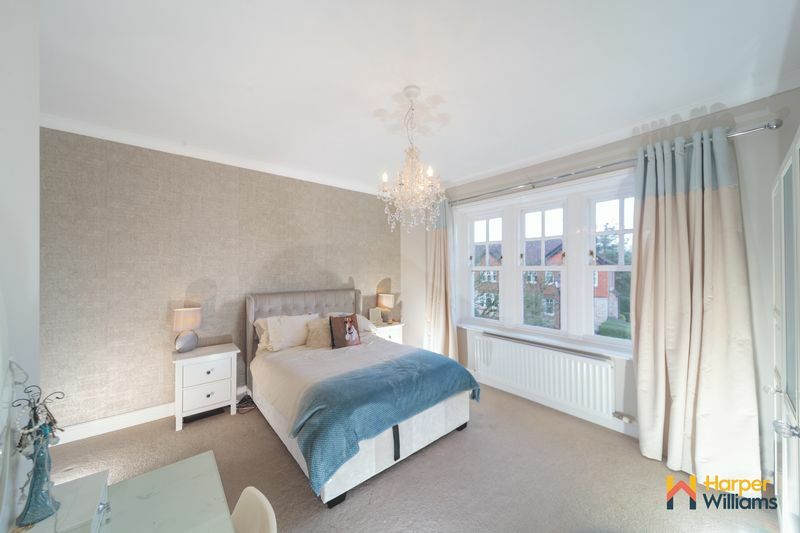 A luxurious master suite complete with a walk-in wardrobe and ensuite shower room, dual aspect sash style windows to the side and front of the property, coved ceiling and ceiling light point, central heating radiator, telephone point and door into the ensuite. A contemporary shower room fitted with a three-piece suite, comprising a tiled shower cubicle with a stylish border, low level WC and vanity wash hand basin with a storage cupboard below, all with chrome fittings and chrome ladders style radiator. Complementary tiled walls and floor, frosted window to the side aspect and spotlights. 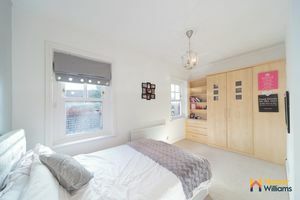 Another great size double bedroom with a feature sash style window to the front aspect with triple panes, coved ceiling and ceiling light point, central heating radiator and door into the utility room. Formerly the ensuite to the second bedroom but currently being utilised as a utility room which is plumbed for a washing machine, sash style window to the rear aspect overlooking the garden, tiled flooring, and central heating radiator. Ceiling light point. 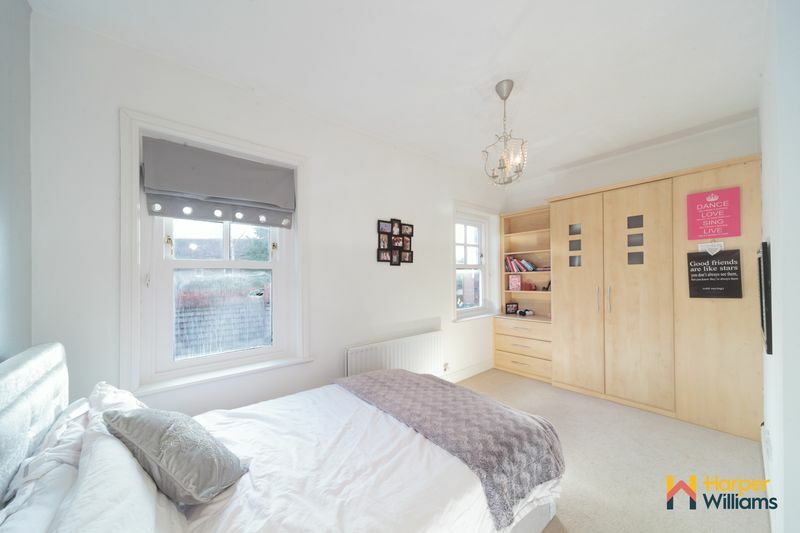 A generous double room with fitted wardrobes, cupboards and shelving, two feature sash style windows to the rear aspect overlooking the garden, central heating radiator and ceiling light point. Another spacious double bedroom with extensive fitted wardrobes and bedroom furniture including drawer units providing ample storage and a separate dressing table, feature sash style windows to the side and rear aspects providing lovely views of the garden, central heating radiator and ceiling light point. 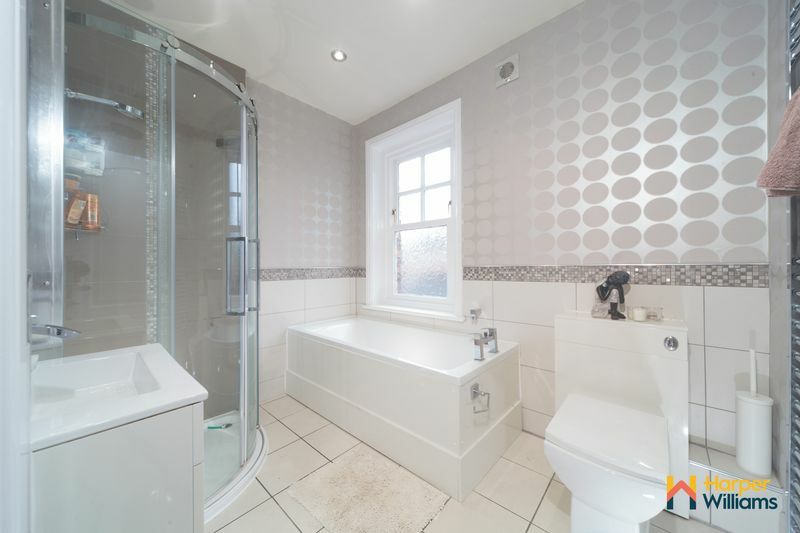 A deluxe family bathroom fitted with a four-piece suite in white all with chrome fittings, comprising a panel bath with mixer taps, corner tiled shower cubicle, low level WC, vanity wash hand basin and chrome ladder style radiator. Complementary part tiled walls with a stylish border, tiled flooring and spotlight complete the look. Double glazed frosted window to the side aspect. 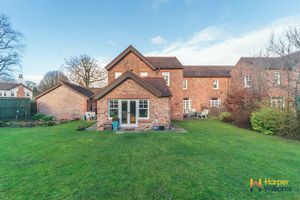 Externally to the front of the property, there are gardens laid to lawn and a large driveway providing ample off-road parking which in turn leads to the detached garage. 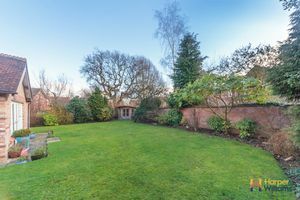 There is a generous garden to the rear which is fully enclosed behind a feature wall and private not being overlooked and with the major advantage of being a sunny aspect, perfect for those summer BBQ days and relaxing evenings! The garden is laid to lawn with mature trees and well stocked borders, raised vegetable beds, a separate patio area ideal for 'Al Fresco' entertaining and a garden summer house ideal for outside storage. Harper Williams have not tested any equipment, fixtures and fittings or services and so cannot verify that they are in working order or fit for the purpose. Any prospective buyer is advised to obtain verification from their solicitor or surveyor. References to the tenure of a property and guarantees are based on information supplied by the seller. As agents, we have not had sight of the title documents or guarantees relating to the property advertised. Prospective buyers are advised to obtain verification from their solicitor. 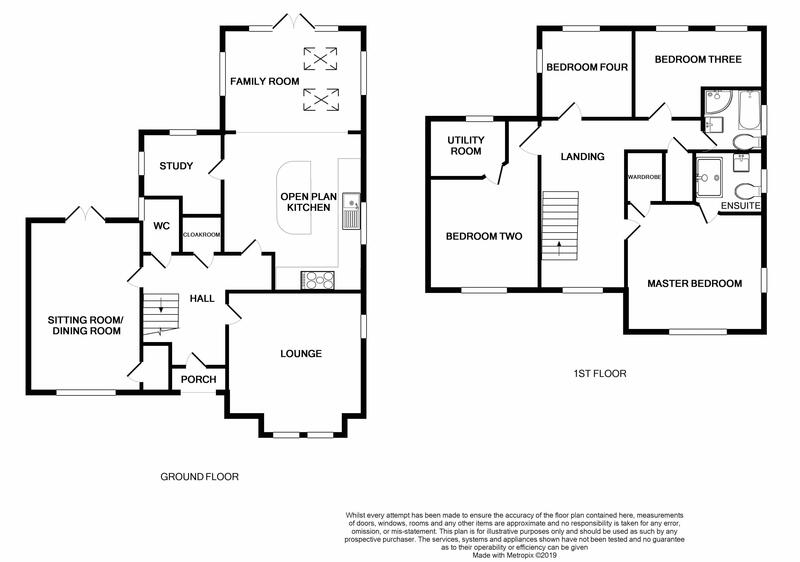 Any floor plans shown are for illustration purposes only and are not drawn to scale. 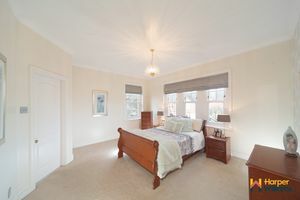 Room sizes stated are approximate, and should not be relied upon for furnishing purposes. These particulars do not form part of any offer, or contract, and must not be relied upon as statements or representations of fact.